If you are aware of and would like to report an illegal activity near or on the levee, please contact Central Valley Flood Protection Board staff immediately at (916) 574-0609. If you work for a Local Maintaining Agency and would like to refer an illegal activity to the Board, please use the LMA Web Application Tool at: http://cdec.water.ca.gov/lma.html. The Central Valley Flood Protection Board (CVFPB) is the regulatory agency responsible for ensuring that the approximately 1,600 miles of State / federal levees and the facilities of the State Plan of Flood Control (collectively referred to as the “System”) are operated and maintained in a manner that reduces the risk of catastrophic flooding for the people and property of the California Central Valley. Pursuant to the California Water Code, the CVFPB is required to enforce, on behalf of the State, the erection, maintenance and protection of levees, embankments, and channel rectification that best serve the interests of the State. In order to effectuate its enforcement duties, the CVFPB is authorized to issue a Notice of Violation and take other enforcement action, as needed, to any person or public agency responsible for an encroachment, flood system improvement, or activity that is in violation of California Water Code, or the California Code of Regulations, Title 23. 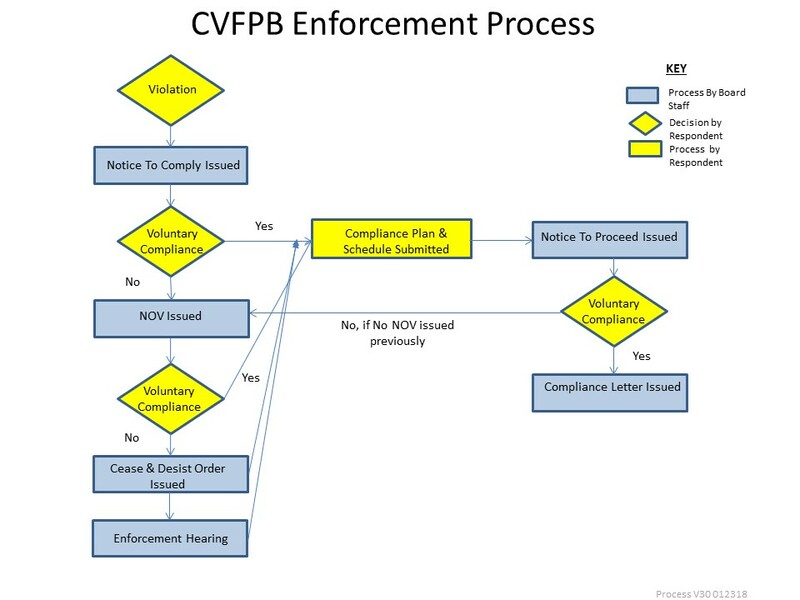 In order to fulfill its enforcement obligations, the CVFPB quantifies, delineates, categorizes, and prioritizes non-permitted encroachments and code violations (collectively “violations”) throughout the System, and determines the need for appropriate enforcement actions. CVFPB staff receives information pertaining to violations that may or may not affect the System from several different sources. The United States Army Corps of Engineers and Department of Water Resources perform periodic inspections of the System and provide the inspection results to CVFPB staff. Violations are also identified by Local Maintaining Agencies or concerned citizens. It is the policy of the CVFPB to maintain a consistent enforcement program, focusing efforts on the most egregious encroachments that are causing damage to the System, or are determined to have the potential to cause damage. With approximately 1,600 miles of levees within the CVFPB’s jurisdiction, the enforcement staff takes a “worst first” approach to address violations throughout the Central Valley. Enforcement actions are designed to be suitable for each particular violation and aim to provide consistent consideration for violations that are comparable in nature and pose similar threats to the System. Enforcement actions require compliance to be achieved in a timely manner based on the type and severity of each violation. Oftentimes, a violation can be addressed without opening an enforcement case by simply notifying the respondent of the violation and working with them toward compliance. Compliance is determined in accordance with California Water Code and California Code of Regulations, Title 23. With this approach, compliance determinations are consistent, valid, and follow the appropriate codes and regulations. Voluntary compliance is encouraged and can be reached at any time during the enforcement process. Once compliance is achieved, the enforcement action may be closed. The enforcement staff pursues violations using an enforcement program that increases the level of enforcement until compliance is reached. This approach is a means to reach compliance at the lowest possible level of enforcement, which is less exhaustive on resources for both the State and the respondent. The enforcement tools that are available are the pre-enforcement Fact Finding Letter, the Notice of Violation, and Cease and Desist Order. When the Cease and Desist Order is issued, a meeting is scheduled before the CVFPB to allow the respondent to contest the Cease and Desist. If compliance is still not obtained, staff will schedule an Enforcement Hearing before the CVFPB and propose issuance of an Enforcement Order including any administrative penalties, not to exceed $50,000 per violation. Please note that this is a summary of the CVFPB’s enforcement program. For complete information regarding the enforcement process, please refer to the Water Code, specifically sections 8700-8709, and the CVFPB’s Regulations located at Title 23 of the California Code of Regulations. You may also refer to additional summary information provided at the links below.